I am a Bengali, and quite used to being referred to as a ‘fish eating’ species. I, for instance, take pride in this fact. Definitely there’s the fact that cooking fish is something Bengalis pride themselves in. And there is such a great variety of taste (both fresh water fishes and seafood) to choose from. You can steam fish, fry it, bake it or even try poaching. There is no limit on your imagination when it comes to having fish. And then consider the fact that fish is celebrated in different avatars throughout the world. The Japanese have their sushi, sashimi and a large part of the world swears by their fish ‘n chips. Thus there is no debating the versatility of fish taste. But what about the health aspects of fish consumption? Naturally we have to evaluate the consequences eating fish can have on our health. Studies conducted by eminent personalities from reputed international universities around the world have concluded that eating fish regularly is beneficial for human health. White fish like cod are a great source of low-fat protein and minerals. Sardines, pilchards and salmon have high concentration of omega 3 fatty acids. Crabs, mussels and shellfish boast of high levels of selenium content. Let us consider the following facts. Fish is a great protein source which offers lesser calories than other meat sources. Reason enough to incorporate a generous amount of salmon or tuna into your diet. You can now have all your protein without having to worry about the calories you need to burn. A Win-win situation, really if you think about it. Do you know that fish oil can help reduce the stickiness of blood? Well, it apparently can. This reduces blood clotting thereby lowering the risk of cardiovascular diseases. Fishes rich in oil like salmon or mackerel are great in this context. No doubt doctors often prescribe fish oil capsules. Let us present another interesting statistic. Did you know that fish consumption can help lower mortality rate by as much as a whopping 17%? Well, it got us too. A research conducted in Mauritius has shown that children given healthy portion of fish in their diets since the age of three are less likely to turn to crime by the time they are twenty three. Necessary action in an impressionable age, indeed. Fish contains selenium, an element known to have cancer fighting properties. A Swedish study conducted over a period of 30 years has shown that men who consume fish reduce the risk of prostate cancer by two times. Researchers all over the world have agreed to this fact. Omega 3 fatty acids present in fish raises levels of the chemical serotonin in the human brain. Increased levels of serotonin acts as an antidepressant and stimulates activity and alertness. This also helps increase levels of productivity and has a positive impact on an individual’s mental health and well being. Dermatologists agree to the fact that a diet rich in fish is a natural way to attain bright and glowing skin. Having fish helps smoothen age lines, keeping you looking young and healthy. Natural cleansing facial, anyone? Fish like salmon, trout, tuna, sardines and mackerel are rich in omega 3 fatty acid content. Regular intake of this omega 3 fatty acid regulates the body’s inflammation cycle. This in turn alleviates painful conditions like arthritis, prostalitis and cystitis. A diet rich in nutritious portions of fish is necessary to keep a balanced level of metabolic activities. Fish consumption can help prevent a wide range of mental degenerative conditions. Polyunsaturated fats present in fishes can help prevent damage to brain cells. 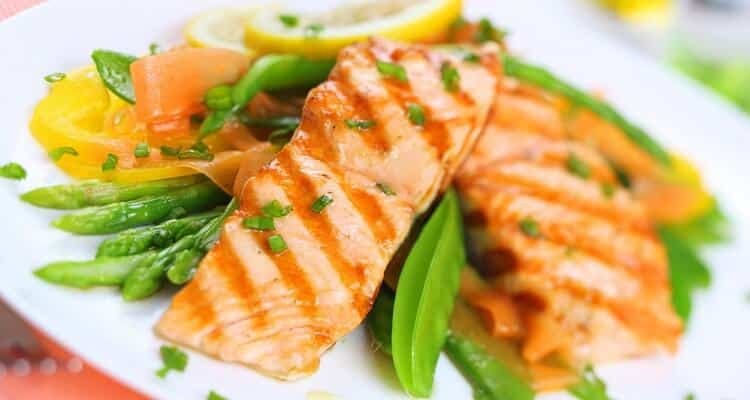 Eating fish lowers the risk of aiments like alzheimer’s disease considerably. A French study conducted over 2000 people has suggested that eating fish can help lower the risk of dementia. A pretty convincing reason to start having at least two portions of fish per week as recommended by the Food Standards Agency, is’nt it ? It is believed that having fish can increase agility and increased level of physical stamina. A diet rich in portions of fish is beneficial for both your physical and mental health and well being. Recently the Harvard School of Public Health reviewed a large range of studies on the benefits of eating fish and concluded that eating fish could potentially lower the risk of death by heart diseases by as much as an astounding 36%. According to the British Heart foundation, fish consumption also increases your chances of survival after a heart attack. Fish lowers the level of triglycerides in blood, associated with abnormal heart activities. Fish oil also helps in regulating the rhythm of heart after a cardiac arrest. Thus it is unanimously agreed that having fish is necessary for cardiovascular health. Portions of fish a day, keeps a heart attack away.